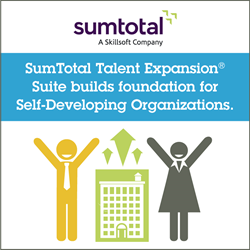 SumTotal, a Skillsoft company, today unveiled the SumTotal Talent Expansion® Suite Winter 2016 release. With this release, SumTotal fundamentally changes the way organizations approach employee development, simplifying the journey to becoming a Self-Developing Organization. The innovative and intuitive capabilities in this release make it easier than ever to develop, promote, mobilize and reward the workforce. More than 80 percent of business leaders say developing the skills of their existing workforce through continuous learning and talent mobility initiatives is one of their top priorities. In addition, nurturing an adaptable talent pool will unlock up to an estimated $130 billion in additional productivity globally. The Winter 2016 release delivers tools that support the critical focus on growing and adapting the skills and capabilities of an organization’s workforce, while simultaneously encouraging talent mobility. The Winter 2016 release of the SumTotal Talent Expansion Suite provides easy-to-use, personalized, actionable tools and insights that adapt to the changing needs and preferences of each individual. These solutions empower every employee in every role in the organization to pursue their own meaningful path for growth without increasing the workload on managers and HR professionals. Configurable Dashboards engage and empower your people to take an individualized approach to development by presenting a comprehensive amount of critical insight in a simple, flexible and actionable way – with multiple views that enable people to effectively balance personal, team and company priorities. Development-Focused Widgets equip users with the drag-and-drop flexibility to focus on the insights and actions most important to them in context of their career goals and aspirations. From optimizing performance in their current role to preparing for a move into their next role, it connects people to the most relevant actions and content to impact growth with a single click. Intelligent Learning Recommendations are delivered throughout the Talent Expansion Suite, leveraging a ‘big data’ algorithm to surface learning activities and content that are personalized to each individual’s precise preferences - making it easier for people to adopt learning and content continuously throughout their work day when and where it can have the most impact. Enterprise Search re-imagines how seamless it can be to browse, discover and pinpoint the information and resources people need to accelerate growth, enabling users to search across the Talent Expansion® Suite and across objects - including learning, people and reports - from a single place. Theming and Branding deliver unparalleled point-and-click personalization capabilities that go beyond a simple logo on a page. This gives administrators the ability to create themes and pages from existing assets with a few simple clicks – a process that can be very costly. To learn more about the Winter 2016 release, visit http://www.sumtotalsystems.com/Winter2016.